A professional consulting hypnotherapist has the skills and resources to diagnose and remove the subconscious triggers that stop you from quitting smoking. If you’re curious about quit smoking hypnosis Melbourne has many practitioners to choose from, and it pays to do some research. Most of my clients have had a couple of goes at quitting before they end up at my doorstep. In fact, millions of people in Melbourne and beyond struggle to beat their smoking addiction – and fail – time and time again. Surely it’s just a matter of willpower…right? Actually, the belief that you don’t have the willpower to quit smoking is standing in your way and I’ll explain why in the next few paragraphs. If you’re trying hypnosis to stop smoking for the first time you’re probably wondering how many sessions you’ll need. Generally speaking, you are a ‘habit smoker’ if there isn’t any emotional attachment to the cigarettes. What that means is you really only smoke because you’ve always smoked (or because you enjoy it). Do I feel like I need cigarettes, or could I just as easily go without? If the answer is ‘no’ to these questions then you’re probably a habit smoker and you may only need one hypnosis session to give up cigarettes for good. One more thing… if you think boredom is not an emotion, think again. It is one of the most powerful emotions around and human beings will do almost anything to avoid it – including poisoning themselves with cigarettes. Some people think they are a combination habit/anxiety type – and that’s all good, because I always include some anxiety work in the first session just in case. If you don’t know which one you are, sometimes you just have to give up smoking and take it from there – you’ll find out soon enough. The important thing is that quit smoking hypnosis in Melbourne isn’t a one-stop shop. Your friend may only need one session to let go of cigarettes for good – you may need three. It’s a very individual thing. 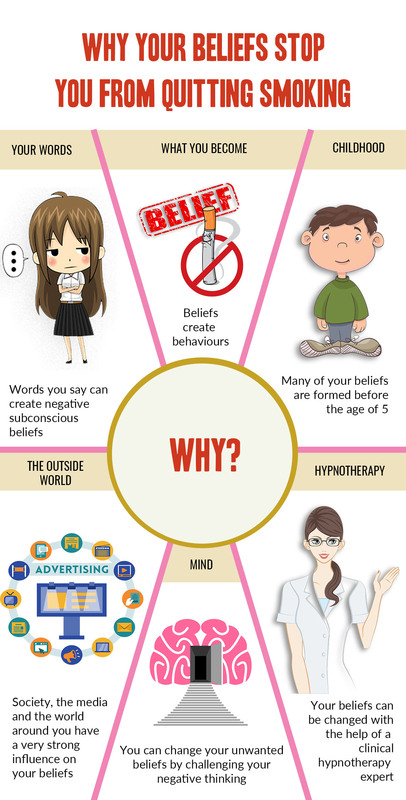 Remember earlier when I talked about hidden beliefs that keep you smoking? Well, that’s where I come in. With your permission and using hypnosis, I can help you remove the subconscious triggers and beliefs that are causing you to smoke. I can also work with the part of you that is using smoking to fill a deeper need and help it to help you in a much healthier way. Your barriers to quitting are different to the next person’s so you need to find a clinical hypnotherapist who will tailor the session just for you. If you want to know more about the process of hypnosis and how it works read this article. My client Matt was a die-hard pack-a-day smoker and had been for most of his life. He’d tried to quit numerous time but the pull of the ciggie with a beer was too strong to resist. You see, when he quit smoking Matt was fine for a while – but the moment he stepped into the pub with his mates, that little voice in his head kept saying: ‘go on….you can just have one…’ Guess what people? You can never (EVER) just have one! Matt had a subconscious block to quitting that kept him stuck in this cycle of behaviour – that’s why he kept convincing himself it was okay to just have one cigarette. I found the subconscious block that was causing the problem and removed it in just one session. I find the best way to work is to offer single pay-as-you go sessions. Your first session also includes a hypnosis MP3 to help you stay off cigarettes. If you think you’re a habit smoker, a single session might be all you need. Different people quit smoking in different ways. Some stop completely all at once, others cut down until finally they are ready to quit for good.Whatever you do, don’t give up on giving up smoking!. If you went from smoking 25 per day to zero and then one day in the future you slip up, it doesn’t automatically follow that you have to go BACK to 25 a day! If you would like to try quit smoking hypnosis Melbourne is the place to be, so contact me here to arrange a time.